Salads play major role in Russian and Ukrainian cuisine especially at holidays or any kind of celebration.At weddings tables are filled with delicious food and big variety of salads;Eggplant salad would be one of them.I love and adore Eggplant salads! My mother in law is a wonderful cook with a heart full of love and care.She is also known as a praying woman. She always likes to surprise her grandchildren with goodies and tries to make something special for her adult children. 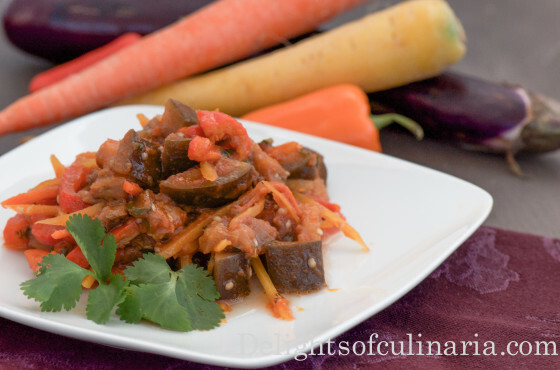 She shared this recipe with me and I would say that it’s my favorite eggplant salad so far.It’s healthy and surprisingly filling.This salad stores well for weeks in a jar or airtight container. Combine marinade ingredients in a pot.Bring to boil. In batches,add eggplant to marinade and cook for 12-14 minutes. Place colander on top of a bowl and transfer cooked eggplants to colander . Cook bell peppers for about 7-8 minutes.Transfer to colander. Cook carrots 5-7 minutes and transfer to colander with the rest of the vegetables. Transfer vegetables from colander to a another bowl.Add herbs,garlic,and 1 cup of the marinade.Mix well to combine all the ingredients.